Sam Hinkie stepped down as GM of the Philadelphia 76ers. The architect behind Philly's 'Process' announced in a 13-page letter that he feels hindered in his decision-making. Hinkie was with the 76ers since 2013. His tanking strategy drew both criticism as praise. Bryan Colangelo will take over GM duties. Former NBA stars Allen Iverson, Shaquille O'Neal and Yao Ming were all inducted into the Hall of Fame. The trio headlined the Class of 2016, which also featured Sheryl Swoopes, Tom Izzo, Jerry Reinsdorf and Zelmo Beaty. Kobe Bryant lives for big moments. Granted, Black Mamba was just a shell of himself in his farewell season, but he sure brought out the goods in his last game. The 37-year-old Lakers guard poured in 60 points (on 50 shots) against the Utah Jazz, putting the game away for good with 30 seconds left on the shot clock. 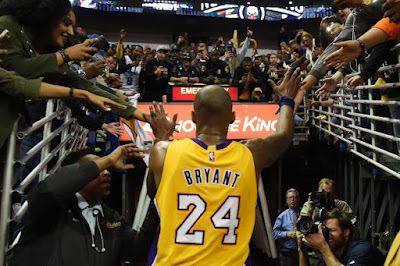 Bryant played 20 seasons in Los Angeles, bringing home five NBA titles. The Golden State Warriors went 73-9 on the season, breaking the NBA wins record previously held by the Chicago Bulls, besting Michael Jordan's 1995-96 squad by one victory. Congratulations to Kawhi Leonard (Defense Player of the Year), Jamal Crawford (Sixth Man of the Year), C.J. McCollum (Most Improved Player) and Steve Kerr (Coach of the Year)! The Rockets, Clippers, Mavericks, Grizzlies, Pistons, Celtics, Bobcats and Pacers were sent on their way in the First Round.